On the invitation of Professor and Dean Shuaizhang Feng, Head of the Institute for Economic and Social Research (IESR), the President of the Global Labor Organization (GLO), Klaus F. Zimmermann (UNU-MERIT, Maastricht), visited Jinan University in Guangzhou/China from March 11 to March 20. The objective had been to intensify relationships and to develop long-term partnerships, in particular between IESR and GLO. IESR has been an early supporter of GLO. Both organizations have agreed on effective measures to deepen and extending the partnership. The following provides a quick overview about the activities during the visit with links to more detailed information and pictures. March 19: Two hours video debate between GLO Fellow Shuaizhang Feng and Klaus F. Zimmermann on long-term unemployment in China and Europe. Click for further details. Further: Meeting with Corrado Giulietti, GLO Research Director, University of Southampton, who visited IESR for the day. Klaus F. Zimmermann gave a one hour personality interview for the IESR Chinese website. March 18: Two hours debate between Hua Liang, the Economics Editor of the top Chinese research journal “Social Science in China” and Klaus F. Zimmermann, the Editor-in-Chief of the “Journal of Population Economics”. They met for a thorough exchange of ideas, strategies and practices of the academic journal business. The meeting was guided by Shuaizhang Feng. Click for further details. March 16-17: Numerous meetings and interactions with IESR researchers. March 15: Klaus F. Zimmermann gave a Public Policy Lecture at the University of Jinan on European Migration Challenges and Perspectives. Click for further details. 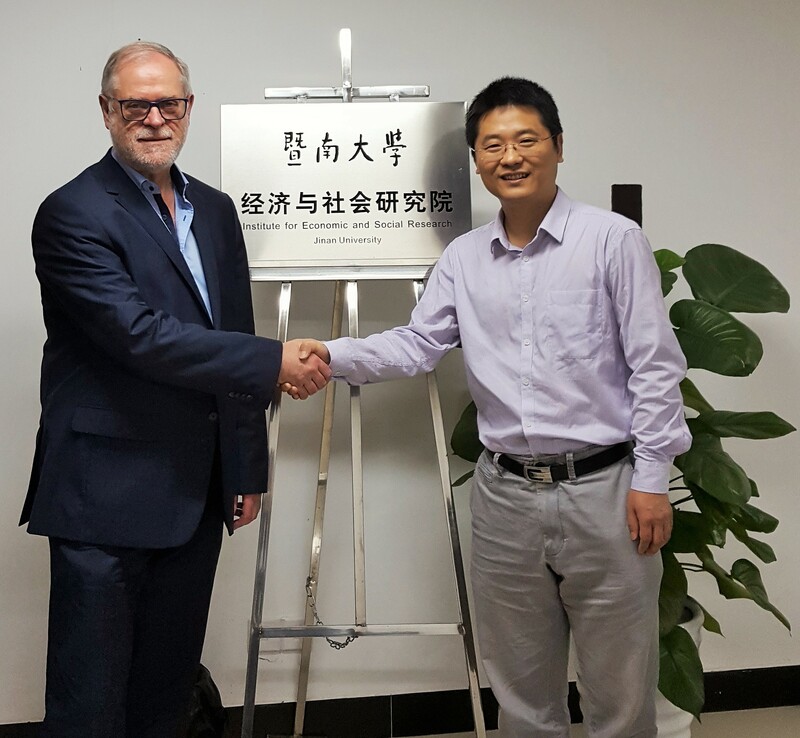 March 14: Klaus F. Zimmermann participated in a research seminar of Zhong Zhao of Renmin University of China, who visited IESR that day to meet the GLO President. Click for further details. Niaz Asadullah (University of Malaysia), who is also the Southeast Asia Lead of the GLO research program, and Klaus F. Zimmermann met to discuss the GLO Southeast Asia program. Click for further details. March 13: First IESR – GLO Labor Workshop took place at IESR, Jinan University. Prominent speakers included Niaz Asadullah, Shuaizhang Feng and Klaus F. Zimmermann. Click for further details. March 12: “Career seminar talk”. Klaus F. Zimmermann discussed career strategies with young IESR scholars. Click for further details. March 11: Shuaizhang Feng and Klaus F. Zimmermann met for an exchange of ideas. Pingback: Kuznets Prize of the Journal of Population Economics given at the #ASSA2019 Reception of IESR in Atlanta.